©2009 Rellek Publishing Partners, Ltd. (P)2009 Rellek Publishing Partners, Ltd. 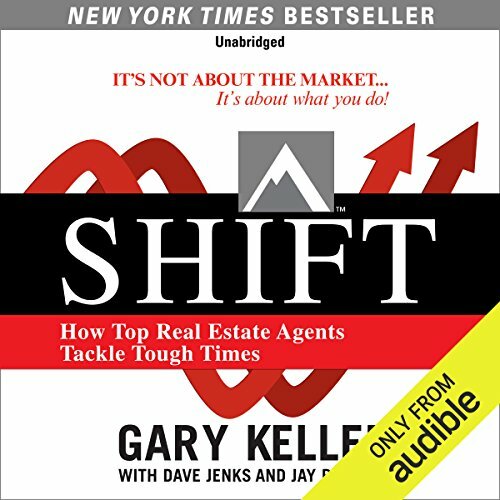 Shift, the latest in the Gary Keller series of books, is an excellent read. It gives the new real estate agent instructions on how to position their practice to survive a slow real estate market and instructions on how to distinquish himself from all of the competitors that are part of an active real estate market. For the experienced real estate agent, Shift gives us the opportunity to pinpoint those activities that have worked well for us to hone and multiply those efforts. The book also warms not to become too dependent upon our favorite activies, even though they are currently working, and to consistantly apply other very valuable activities to grow our current businesses. For anyone actively working in real estate, this book is a must read. The new real estate agent may not immediately appreciate the great value of this book. It takes having barely survived a few real estate market "Shift"s before the value of this book becomes evident. Shift is an amazing book, and I was looking forward to being able to listen to it as an audiobook. But it downloads from Audible as a single track. . an 8 hour track!!! Were the people really so lazy they couldn't carve this up into meaningful chapters? I would have given 5 stars if it was more professionally digitized. Interesting stuff - but when I purchase a book I expect to get access to everything - like the password to access all the tables and diagrams as suggested by the narrator. I emailed the publishers to see how I could access the above but got no response. It's like buying half a book. How much would it take to say,"Look, to access the drawings and doodahs will be an extra five dollars, but to have the gall to call the publication - unabridged is a load of shift. Very disappointed, I was hoping Mr. Keller was going to help me in my real estate career but he didn't deliver the goods. I think Audible should be taken to task for only 1/2 selling something. I wouldn't have purchsed the audiobook if I knew that I wasn't getting the 'unabridged' version - which should give me access to book's website. 37 sur 45 personne(s) ont trouvé cet avis utile. You will hate this book - if you think you know everything! Perfect for the new real estate agent and the few agents who don't know everything. When baseball player is in a slump what do the do? They get back to basics. This book is the basics. I have been in sales for a long time, though new to real estate, but see the same problems with people. Some people just know everything and still want someone to hold their hand (they give this book 1 star). Must read for any realtor. No matter where you are in your career. Compelling information. This is essential reading for all agents. If you are going to last in real estate- you must be prepared for a shift. Great book, with some valuable information. This is something for ALL business men or women. A Shift is upon us. Time to get prepared for the next change in the market.